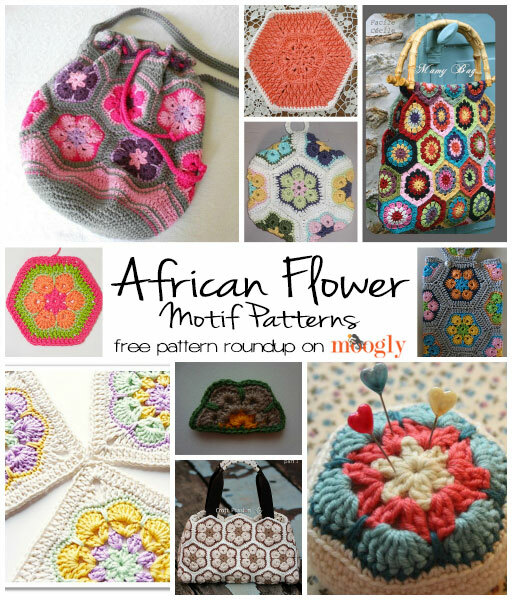 The African Flower Motif might just be the new granny square! This one motif seems to be able to form the basis of any number of patterns. 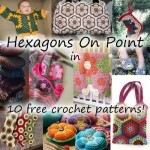 It’s fun, beautiful, easy, and visually striking – and here are 10 free patterns that show it off! 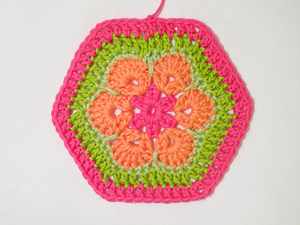 African Flower Hexagon Crochet Tutorial by Heidi Bears, on Heidi Bears Blog: You can’t have a discussion of this motif without talking about Heidi Bears! Her crochet animals and other patterns made with the AF motif are a HUGE hit! While her animal patterns are for sale, she offers a great step by step tutorial for the basic motif for free on her blog. She also has a free pattern and tutorial for a Pentagon version! 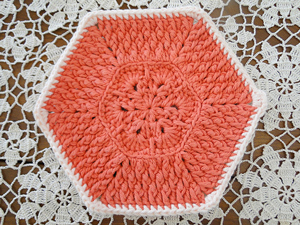 Half African Flower by Bigú Osuna, on Crear con hilos blog: The trouble with hexagons is getting a straight edge when you join them – this pattern for a half flower fills in the gaps so you can design your own project! 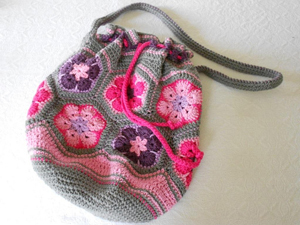 African Flower Bag by Gunilla Karlsson, on Alla dagar som gick: Take the motif from Heidi Bears above, and you can use it to make this bag! I think this bag is just gorgeous, and there are instructions in English, Swedish, and German! 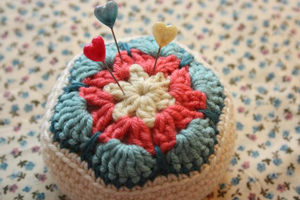 African Flower Pincushion by Sandra Paul, on Cherry Heart: Simple and sweet, so pretty on a sewing table! Includes a step by step photo tutorial! 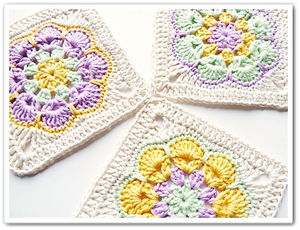 African Flower Square by Barbara Smith, on Made in K-town: Turn the AF motif into a square and there are even more possibilities! A blanket, a bag, a scarf – so fun! 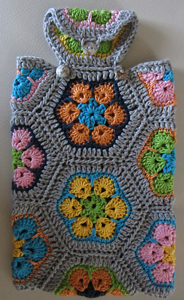 African Flower Purse by Joanne Loh, on Craft Passion: A bag of a different shape, this one is perfect too. The two part tutorial includes both the crochet instructions and how to sew the lining and handles! African Flowers Hot Water Bottle Cover by Gina Ross Design, on Natural Yarns: Would you hate me if I said Hot Water Bottle Covers are “hot”? Ok, skip that then – the fact is, if you knit or crochet and live where hot water bottles and tea cozies are the thing, then this version is a great option! African Flower Dishcloth by Casey Downing, on Plus 3 Crochet: Grab some kitchen cotton and start with the standard AF motif, then add the rows for this pattern and soon you’ll have a chic new dishcloth or spa cloth! 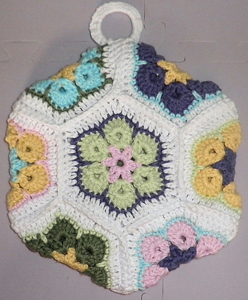 African Flower Hotpad by Darlisa Riggs, on Crochet Uncut, Fall 2011: Double layered to make a great trivet or thick potholder, this tutorial makes the clever joining look easy! 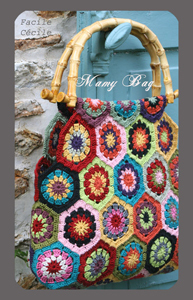 Mamy Bag by Cécile Franconie, on facilecécile (Ravlery link): Ok, one more bag… This pattern is the first thing I saw made with the AF Hexagon, and I immediately fell in love. Now the pattern is only available via the Wayback Machine, and it’s in French. But do not despair! An English language version is linked, and though it uses a different hexagon pattern, the rest of the info is the same. And since we have the hexagon pattern above, you’re all set! Are you onboard with African Flower motifs? Have you made a Heidi Bears pattern or one of the free patterns listed here? 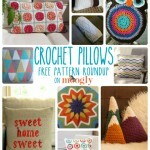 Is there a great free pattern I missed? Tell me about it in the comments! 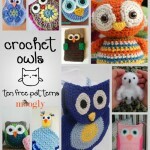 Hoooo Wants Another Crochet Owl Pattern Roundup! I’d like to thank you for providing wonderful free patterns. 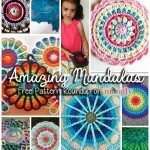 It’s a real service to us crocheters who haven’t much to spend on patterns! 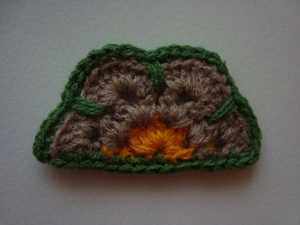 That hot water bottle cover is one that I made just a couple of weeks ago. I gave permission to Gina Ross to publish it on Ravelry with her pattern. Can’t believe it has already been picked up by someone else – namely, Moogly. It’s super cute Rosina! Great pattern! I have made a couple of the animals designed by Heidi Bears and they are fantastic! Super cute and fun. I made them using worsted weight acrylic so they are a bit large, but the recipients love them. I am excited to see these other projects as the African flower motif is so fun and versatile in how you can use color. I also wanted to make an amigurumi animal using this African Flower pattern using worsted weight yarn. Did you find at the fibrefill stuffing showed through the small holes in the motif? I worked a sample in the suggested 5 hook and downsized to a size 4 hook which I found worked out better. Thanks for your reply. Thanks for including my dishcloth pattern! Thanks for this, been loving all of the pictures of African flower afghans that I’ve been seeing lately and have been meaning to try one, will give these patterns a look for sure! This is my favorite pattern… the African Flower is so versatile! Thank you for these wonderful items! You’re very welcome! It was a fun collection to put together! How do I download the10 fun & free African Flower Motif Patterns from your website? I made a fabric-lined bag out of African Flower hexagons using Brava Worsted yarn from knitpicks. I didn’t use a pattern for the bag and found the joining was a little tedious. I tried to post it but couldn’t figure out how. Thanks for round-up! Think I’ll try a couple of these. Is there a free pattern for a Heidi’s bear? I believe all of Heidi’s patterns are paid patterns. From what I hear they’re worth it! I haven’t made any of the Heidi Bears patterns myself, but it does seem like it could be an issue! You might want to drop another hook size and see how that turns out. Where can I find written patterns for the hexagon and pentagon motifs? Thanks. Is there a place to find any free patterns for the African flower animals?